Archaeologists believe that the ancestors of the Yup’ik people originated in Siberia, from where they slowly migrated, settling about 3,000 years ago along the Western Alaskan coastal regions and in the Yukon and Kuskokwim River valleys. Today they number some 25,700, with approximately 24,000 living in the United States (mainly in Alaska) and a further 1,700 living in Siberia. The name Yup’ik (the plural is Yupiit) is a combination of the word Yuk, for “person” and Pik,meaning “real.” The language, known as Yuk or Yuiit, (some dialects use Cup’ik which refers to both the people and the language) is still spoken by about 75 percent of today’s Yupiit. 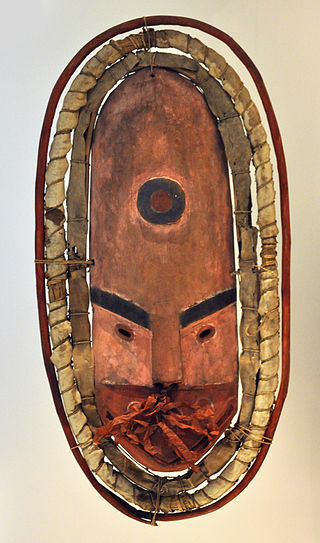 Dance mask of tunghat, Southwest Alaska Eskimo, acquired 1915. The Yup’ík people, being semi-nomadic, traditionally followed the seasons, moving in family groups. In the spring, they would travel to their fishing camps where they fished, hunted sea mammals (seals, walrus and–until fairly recently–whales), and collected berries and plants. As the seasons progressed and the weather became untenable, they returned to the village sites and settled down for the duration of the harsh winter. The women lived together in the ena, situated close to the qasgiq, which is the traditional communal house in which the men lived. The qasgiq also served as the center for teaching the young boys survival, hunting, and life skills, and where some of these skills were taught to the girls. Probably the most important feature of the qasgiq, however, was that it was used as the community center for ceremonies and festivals where singing, dancing, and storytelling took place. It was here that the Yupiit learned and practiced their culture. This building was where the use of masks became a vital, integral part of their belief system. This idea centered on the acceptance of good and evil spirits, and the assurance that all living creatures experience the cycle of birth, death, and rebirth. Various ceremonies emphasized the different aspects of the relationship between humans, the animals, and the spirit world. The Shaman, an important person in this belief system, was seen as the mediator between the people and the spiritual world. He was there to invoke, through visions, various spirits that would give him guidance. He was also the person who exorcised evil spirits that caused illnesses; the Shaman was responsible for summoning friendly spirits to intervene when evil spirits caused bad occurrences. For all these ceremonies, he used specific masks to enable him to execute his duties correctly. The Shaman wore a mask during many traditional rituals in which the relationships that occur between a man and his ancestors, or a man and the animals he relies on for food (life), were re-enforced. 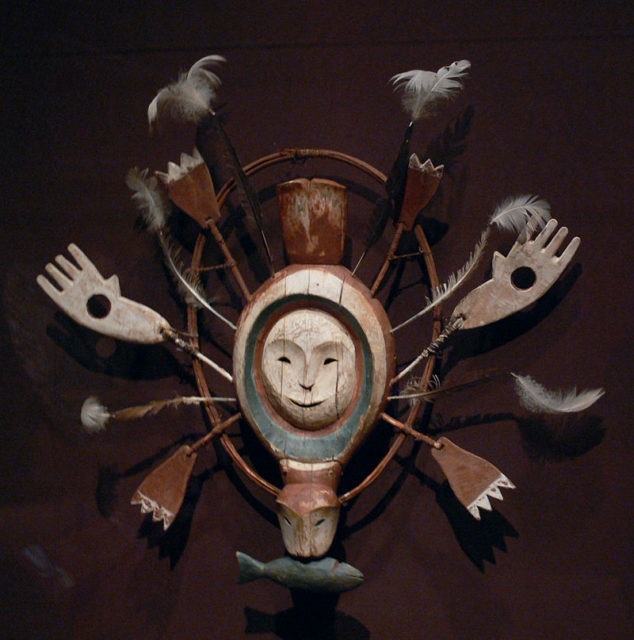 Using dances and storytelling, the Shaman, wearing his mask, would represent his own spiritual helpers. During his visit to the spiritual world, these helpers would inform him on the wishes of the game animals, and encourage the animal spirits to return in spring so that they may give their bodies to the hunters. The mask would usually be in the form of a chosen animal–the most popular being wolves, seals, sea birds, or even mythical creatures. Some masks would sport large or goggley eyes, which represented the enhanced spiritual state and vision which the wearer had reached. All the people were involved in the making of masks, usually under the guidance of the Shaman, for the masks used in the ritual dances were aimed at pleasing the spirits. 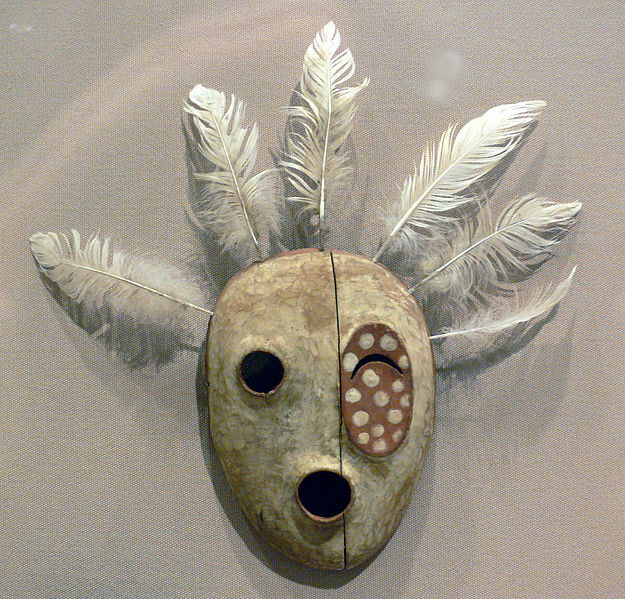 It is not possible to allocate a meaning to each mask, for often the storyteller would fashion a mask to be used for the enactment of a particular myth or traditional story in which animals or mythical beings took the form of humans. Many of the stories told were of an informative or an instructional nature and dealt with tribal, moral, and ethical mores. 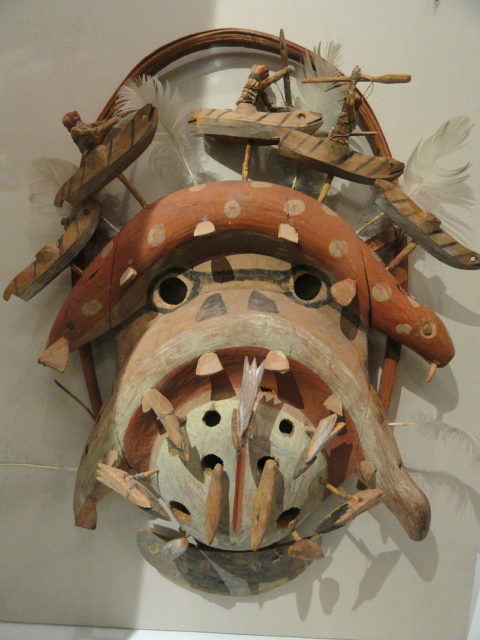 Sometimes the story related by the storyteller was of his personal experiences or adventures, and then the mask became a representation of his own beliefs. It is painted in three colors (red, blue-green, white), with a wooden ring, a seal with a fish in the mouth, a hole with a big thumb as a jewel attached to the body, and feathers. Dallas Museum of Art, Dallas, Texas, late 19th century. 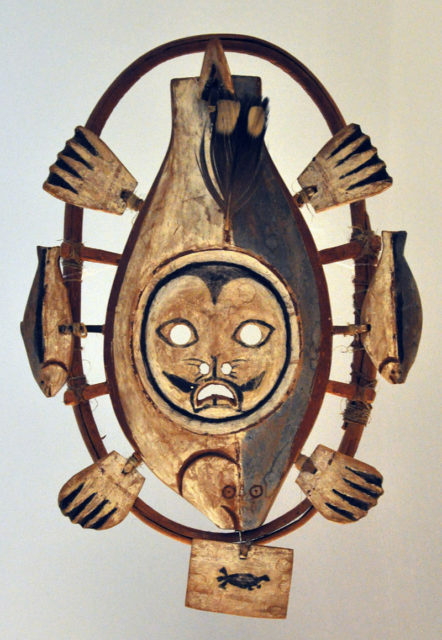 Use was made of skilled woodworkers to carve these very interesting, unusual, and often complex masks. They utilized materials readily available to them; wood was the most popularly used medium, but much use was also made of hides (leather), bones, and feathers. Some of these masks even had movable parts. The masks were usually carved, then decorated and painted. Those created from leather or hides were stitched or lashed together and also decorated with items such as stones, feathers, beads, or teeth. They were often painted with red ocher to a shade that would make them look similar to human skin. Some very small masks were called finger masks and were often carved from bone or tusks. These would be made for wearing on the hands and were used in group dancing. The dancers remained in one position and moved only the upper body and arms in gentle, graceful movements that were accentuated by the finger masks. Masks used in the winter ceremonies were often so large that they required a number of people to hold them up. Some were so massive – to support a variety of theatrical devices – that they had to be hung from the roof. 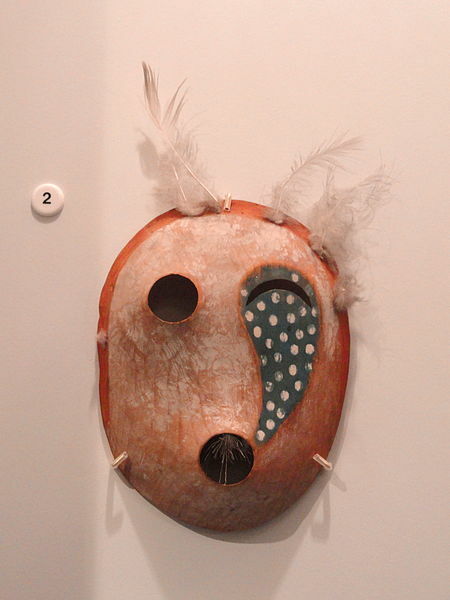 The masks formed part of the belief in a complicated spiritual life that honored those beings that made life livable for the Yupiit in their harsh homeland. Masks were an important feature in many ceremonies since they, in effect, would “illustrate” the story. Those used by Shamans to facilitate communication between the worlds of human beings, animals, and spirits, were said to have made the unseen spirit world visible. Most of the masks were discarded after use, and that fact, together with normal deterioration of the materials used, means that there are few original Yup’ik masks left today. While we all know that times move on, it is sad that many of the old traditions have slowly become lost–and so it was with the Yupiit rituals of singing, dancing, and storytelling using these fascinating masks. The skills of mask-making have largely fallen away too. 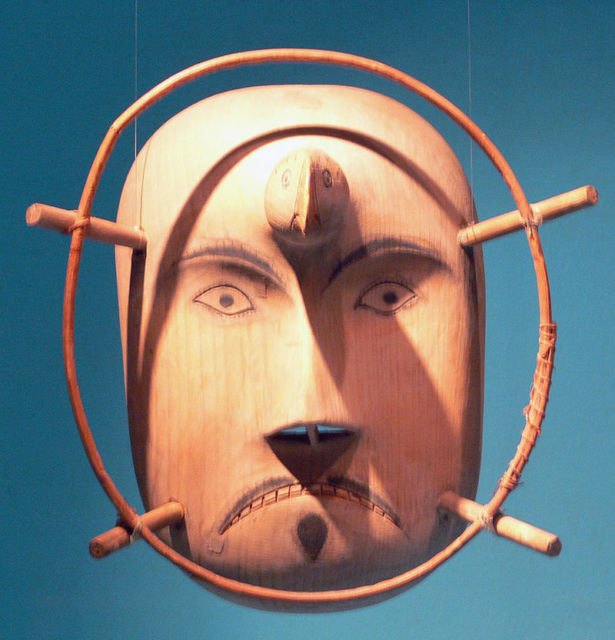 Fortunately, a small number of original Yup’ik masks found their way into collections, and many are on display in museums. 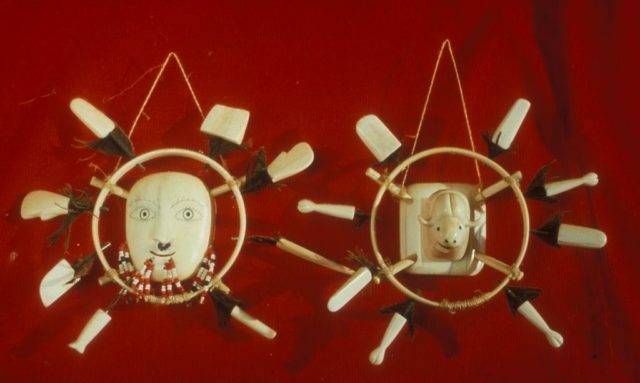 Contemporary stylized ivory single-color mask, ringed with ivory sculpted as a jewel in the circle, on the left with human eyes, musk cattle on the right. The positive reaction to the public display of these beautiful masks has generated further interest in them as well as in the traditional ceremonies for which they were used. This has resulted in many of the masks being returned to their original homes. Some of the elders still remember many of the stories and dances associated with certain masks, and interest has been renewed in traditional mask-making. Many of these elders still recall that the wearing of masks seemed to engender a spiritual power that breathed life into the stories of the performers and was a way of “making prayer”. 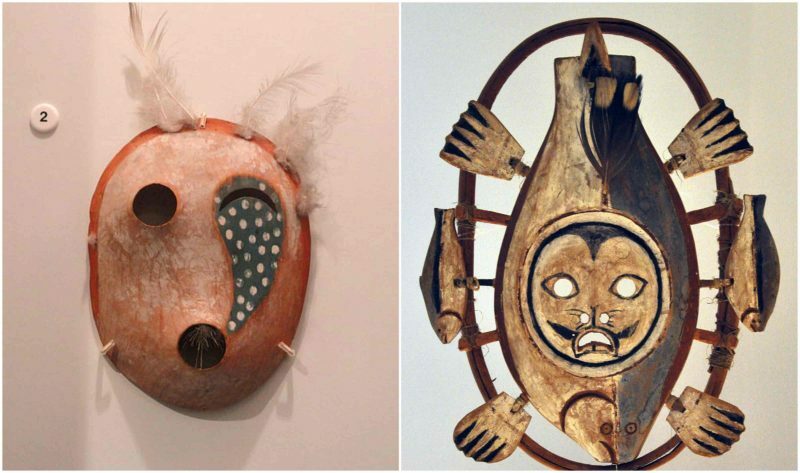 Today, many of the younger Yup’ik people are, for the first time, being made aware of these artistic masks as pieces of their heritage. They have become interested in learning more about the historical traditions of singing and dancing and telling stories – all of which are beginning to have great meaning for them. We may yet see the Yup’ik youth “Making Prayer” once more. This entry was posted in ART, BUSINESS, History, Russia, Scotland, Travel, World by rolyred. Bookmark the permalink.